Until now RaamAnujar was known as IlayAzhwAr ; from now on He enters the phase of Udayavar . 35. Return to Srirangam & the Expansion of the 5 branches of Kaimkaryams at Srirangam to 10 branches —-1053( Age 35) . 45. 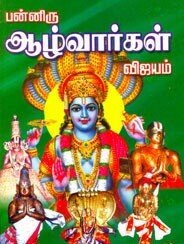 Utthama Nambi’s attempt to poison RamAnuja ; 3 day upavAsam by Ramanuja ; alarmed ThirukkOttiyUr nambi arrives at Srirangam and appoints Kidambi AcchAn for Kitchen Kaimkaryam for Ramanuja . KidAmbi AcchAn becomes MadapaLLI AacchAn—PurattAsi 1054 (Age 36). 51. AruLALa PerumAL EmperumAnAr creating Jn~Ana Saaram and PramEya Saaram ; NallAn Chakravarthy becoming a sishya–1055(Age 37). 52. Wife of Bitti Devan arrives at Srirangam to recieve RaamAnuja’s blessings and to visit ThondanUr Nambi; she returns home to Belur and presses her husband to become a VaishNavan —Marghazhi 1055 (Age 37). 54. Bitti Devan consecrates Vijaya NaarAyaNan at Belur—hEviLambi Chiittirai, 1055 ( Age 37) . 61. Hesitation to Climb Thirumala ; AnanthAzhwAn , His disciple urges Ramanuja to perform MangaLAsAsanam there ; half way beteween Thirumala and Thiruppathy , Periya Nambi , his uncle meets Ramanuja . Stays at Tirumala , observes upavAsam for 3 days so he does not need to create any asudhdi at Thirumala—1057 ( Age 39). 62. 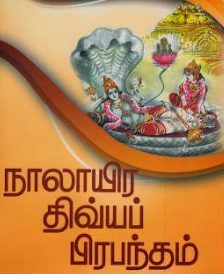 Learning SookshmArthams of Srimath RamayaNam from His uncle ( Periya Thirumalai Nambi ) for an year at Lower Thiruppathi—Kaarthigai 1057 ( Age 39) . 63. Creation of VedArtha Sangraham in front of Lord SrinivAsa at Thirumala —1057/58 ( Age 40). 65. When resting at Kanchi after visit to Thirumala, Govindhar wants to return to Periya Thirumalai Nambi ; Ramanuja sends him back and Periya Thirumalai Nambi rejects him ; Govindhar returns and begs to be accepted again as a Sishya by Ramanuja — 1058 ( Age 40) . 66. Govindhar accepts SanyAsAsramam & becomes EmbAr–1058 (Age 40). 69. 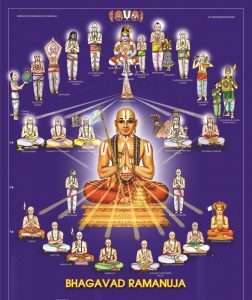 Ramanuja entrusts the protection of the temple to UrangAvilli Daasar , Koil NirvAham to MudaliyANDAn and parivAra nirvAham to AkaLanganAttAzhwAn and leaves on a dhig vijayam with KurEsar and a few other sishyAs —1059 ( Age 41). 70. At Kurungudi , Ramanuja performs UpadEsam on dhvayam to PerumAl, who came as a sishyan and names his new sishyan as VaishNava Nambi. 71. Visit to DhwAraka on the way to Kaashmir to defeat adhvaithis in front of SaaradhA Peeta Saraswathi’s sannidhi , declared winner by Her ; Gains BodhAyana Vrutthi and on the way adhvaithis attack and take the Vrutthi back; KurEsar says that he has retained the Vruthti by heart for future reference . 73. Visit to ThiruvEnkatam: rejection of the rights claimed by Saivites and asking the Lord to accept the Sanku and chakram that were removed earlier by the Saivites ; Composition of MangaLa slOkma to commence the writing of Sri BhAshyam—1060 (Age 42). 74. Return to Srirangam —1060 ( Age 42). 75. The birth of Bhattar and SrirAma PiLLai for KurEsar and naming of them as ParAsara and VyAsa by Ramanuja—1062(Age 44). 76. Completion of Sri BhAshyam—1062( Age 44). 77. Ramanuja performs abhinayam for a Paasuram in a locked room ; PiLLAn sees this thru a key hole and guesses correctly from the signs that his AchAryan was performing abhinayam for Swamy NammAzhwAr’s Paasuram on ThirumAlirumchOlai . When Ramanuja hears about it , He celebrates PiLLAn as the descendant of the NaaTa Muni Vamsam and names him as KuruhUrpirAn PiLLAn and accepts him as his Jn~Ana puthran—1074(Age 56). 78. 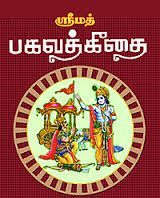 Delighted over the blissful reaction of Swamy NammAzhwAr’s Paasuram by PiLLAn , Ramanuja assigns the task of composing the first commentary on ThiruvAimozhi known as 6000 Padi by PiLLAn- – -1074 (Age 56) . 79. 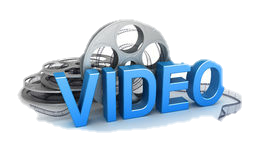 PiLLAn completes his commentary (6000 Padi) — – 1076 ( Age 58). 80. 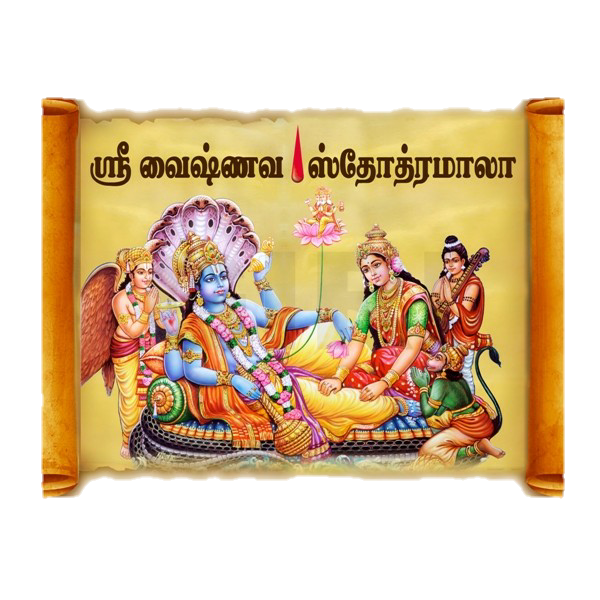 The fanatic Saiva king writes “SivAth parataram nAsthi ” ( There is no god greater than Siva) and sends a messenger to get Ramanujar’s agreement thru signature on that palm leaf . NaalUrAn , a sishyan of KurEsar recommends that Ramanuja sign. KurEsar senses danger and requests Ramanuja to leave Srirangam for safety —-1076 (Age 60) . 82.KurEsar goes to the ChOLA king’s court in place of Ramanujar and accompanied by Periya Nambi; Kuresar & Periya Nambi disagee with the king and lose their eyes —1078( Age 60) . 83. Ramanuja GhOshti travels on towards Melkote ; Fasting at Yadhu Giri for 7 days—1078(Age 60). 84. The group of Hunters welcome Ramanuja and serve Him and the GhOshti —1078 (Age 60). 85. Ramnaujar asks one member of His ghOshti and one of the Hunters to go to Melkote Koil and bring back 45 sishyAs of His —1078 (Age 60) . 86. The first batch of hunters entrust Ramanuja to another hunter 6 miles away— 1078(Age 60). 87. The new hunter showers the visitors with all kinds of comforts and brings the ghOshti down to the village at the foot of the hills , Harthana Halli , where KaTTaLaivAri KOngu PirAtti dampathis lived —1078(Age 60) . 88. At Harthana Halli , Ramanuja is served by Kongu PirAtti and stays fro 4 days at her residence and confers the Daasya Naamam of Thiruvaranga Daasan on Her husband . 89. Ramanujar continues on to the village of RamanAtha Puram on the northern banks of Cauvery river and stays for 3 days—1078 (Age 60). 90. Ramanuja GhOshti arrives at Mithilapuri and stays at the Yoga Narasimha Temple—1078 (Age 60). 91. The SmArtha adhvaithis of Mithilapuri (Kovai) are won in debates and the village is renamed SaaLagrAmam —1079 ( Age 61). 92. Vaduga Nambi becomes a sishyan —1079 (Age 61). 93. ThoNdanUr Nambi arrives at SaaLaigrAmam to invite RaamAnuja GhOshti to ThondanUr and houses them in the local Yoga Narasimha temple and briefs Ramanuja on the Vaibhavam of Yadhu Giri ( ThirunArAyaNa Puram). 94. At ThoNdanUr , Ramanuja defeats the dhigambhara (naked) Jain sanyAsis from behind a curtain ; the defeatd Jain leaders level their matams and build the ThirumalaasAgaram PushkaraNi from the stones —-1079 (Age 61). 95. KurEsar returns to ThirumAlirumchOlai with his family and composes Sundara Baahu Sthavam there —1079 (Age 61). 96. King VishNu Vardhanan ( Former Bitti DEvan) arrives with his wife to prostrate before RaamAnuja at ThoNDanUr— 1079 (Age 61). 97.Grieved over unavailability of the sacred clay ,Ramanuja fasts for 3 days and goes to Yadhu Giri and finds NaarAyaNa PerumAL at he South western directin of KalyANi PushkaraNi— 1079 (Age 61). 98. That night Ramanuja sleeps with worry about the unavailability of the sacred clay ; he dreams that the desired clay is on the north western bank of KalyANi Theertham and finds it there —1079 (Age 61). 99. Ramanuja builds the broken down temple of NaarAyaNa and consecrates the Lord ( ThirunArAyaNan ) there and renames the village from Dukkha Garudana haLLi to ThirunArAyaNa puram–1080(Age 62). 100. Ramanuja Travels north to bring back Raama Priyar ( uthsava Moorthy of ThirunArAyaNa Puram temple) , finds Him at Delhi and brings HIm back. He names the Lord “Sella PiLLai “—1081(Age 63). 102. Ramanuja consecrates Lakshmi NaarAyana archa at ThoNDanUr –1085(Age 67). 103. Ramanuar defeats SengAmi MaayA Vaadhis and builds RaamAnuja Matam at ThirunArAyaNapuram ; He performs Prathishtai for Pancha NaarAyaNa at Belur —1089(Age 71) . 104. Visitors from Srirangam brief Ramanuja on the ascent to Parama Padham His AchAryan , Periya Nambi; Ramnauja asks for SrichUrNa ParipAlanam and adhyayana Uthsavam ( iyal SaaRRumuRai) for HIs AchAryan ; RmamAnuja sends his disciple , Maaruthi SiRiyANDan to find out about the well being of KuResar at ThirumAlirumchOlai —-1090(Age 72). 105. SiriyANDAn arrives at ThirumAlirumchOlai , delivers the greetings to KurEsar . He brings back the invitation from Raja Raja ChOzha raajA for Ramanuja’s return to Srirangam and gives that request from the king to Ramanuja at the banks of KalyANi theertham —1090 (Age 72). 106.Ramanujar appoints 52 sishyAs to stay at ThirunArAyaNapuram for Temple nirvAham and Kaimkaryam . He blesses the Tamar uhantha ThirumEni behind as their raksha and returns to Srirangam—1090 (Age 72). 107. KurEsar returns from ThiurmAlirumchOlai and prostrates before his AchAryan at Srirangam —1090 (Age 72). 108.Ramanuja bathes in Cauvery , performs His anudshtAnams and stops at KurEsar’s house and comforts him —1090(Age 72). 109. Raja Raja ChOzhan hands over Koil NirvAham to Ramanuja and AchAryan accepts it –1090(Age 72). 110. Ramanuja consecrates new image of Swamy NammAzhwAr and other AzhwArs and restarts the Adhyayana Uthsavam that was interrupted due to the fear from road side robbers between AzhwAr Thirunahari and Srirangam—1091 (Age 73). 111.The last rites done by PiLLai Thirumalai Nambi at Thirumala . Latter arrives at Srirangam to give the news to Ramanuja , who travels to Thirupathy—1091( Age 73). 112. Ramanuja consecrates the archa of Govindha Raaja at Thiruppathi — 1091 (Age 73). 113. Thirukkacchi Nambi ascends to Parama Padham—1092(Age 74). 114. Raamanujar presses KurEsar to create a sthuthi( Sri VaradarAja Sthavam ) . Lord Varada appears in KurEsar’s dream . Ramnuja hears it from KurEsa , reads Sri VaradarAja Sthavam to his AchAryan and both arrive at Kaanchi thereafter—1093 (Age 73). 115. Expansion of Sri BhAshyam by 150% —1095 (Age 75). 116. Viist to ThirumAlirumchOlai with KurEsar to present 100 vessels of AkkAra Vadisil and 100 vessels of VeNNai according to ANDAL’s Paasuram ( NaaRu NaRum Pzhil) in NaachiyAr Thirumozhi—1097 (Age 80). 117. KurEsar ascneds to Parama Padham —1107( Age 90). 118. SathAbhishEkam ( here 100th Thirunakshathram) and recieving the Birudhu of YathirAjar —1117 (Age 100) . 119. Thaam Uhantha ThirumEni Prathishtai through a sculptor named Ramanuja Daasan and having it consecrated at Sri PerumbhUthUr , His avathAra sthalam—1119 (Age 102).